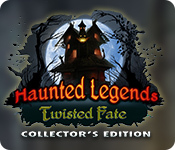 Haunted Legends: Twisted Fate Collector's Edition is rated 3.0 out of 5 by 15. 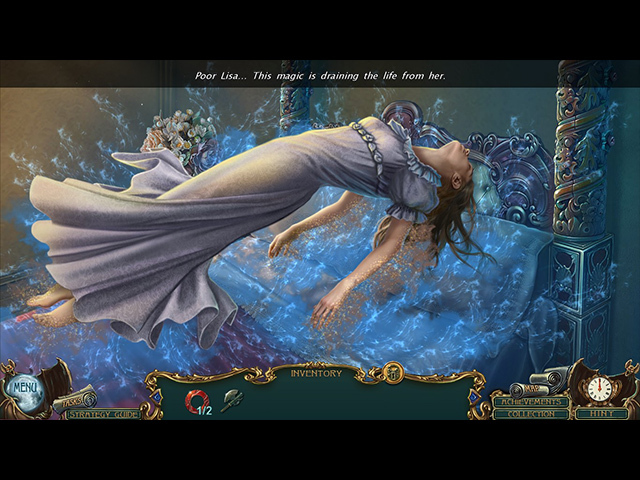 Rated 5 out of 5 by marinasmyths from A Good Game I enjoyed the game, the puzzles in the game were solvable for me. I liked the storyline and I had expected St. Germain to come up at some point, only his name came up, will they raise him? Rated 5 out of 5 by Majestyx12 from Talking Stone Lions I enjoyed this game. It's relaxing. The puzzles are one's I can do. The hops are good list ones. Replays on hops and mini-games. Collect 26 morphs. I'd like to see where Lisa ends up in the story. Will they raise St. Germain? Rated 5 out of 5 by biscuitsmama from A GREAT HAUNTED LEGENDS – WHAT A NICE SURPRISE! Totally in agreement with what another reviewer wrote, I too thought this series should have long ago been put to bed. However, as with another recent game from this develop, I was pleasantly surprised to find that AMAX has upped its game and seems like it is finally back on track. Haunted Legends Twisted Fate is for me a great game after a string of failures in the series. The storyline was interesting and kept me engaged, not only with the story but with the excellent puzzles and very entertaining HOPS, one of which included a mini-HOS within a larger HOS. I found it easy to get started and find what I needed in order to move ahead. Although there are places in the demo where the game seems to lag a bit, the story quickly picks up with a twist. Maybe it is because I own dogs that I didn’t seem to notice wolves or dogs constantly howling in the background but some people might be more sensitive to that than I am. After the cliffhanger at the end of the demo, I ended up buying the full game and I am happy that I did because I am finding it to be quite enjoyable and longer than I had expected. We see some familiar faces in the game since we know them from other games in the series, which for me in some ways ties the whole Haunted Legends series together or gives it a feel of continuity. If like me you felt you were over the Haunted Legends games, I recommend that you at least try the demo for Twisted Fate to see if you might enjoy this one. Happy gaming! Rated 5 out of 5 by CasualGran from Great Again! To be honest, I looked upon this series as a bit outdated and over it's best period, but this game has proved me wrong! It's excellent! Crystal clear graphics and an interesting storyline and characters. Really fun to play! Thanks devs! Good job! Rated 3 out of 5 by Volauvent from A mixed bag of game play - meh... You know, I am confused about writing a review for this one. On the one hand, the game has all the quality one has been taught to expect from the Haunted Legends series, and on the other, well .... you can't trust the dialog. Look: Twisted Fate has excellent everything except it gets lost in translation - a lot. The English is very poor, really mixed up at times, and sometimes quite good. It's as if there is one team member who speaks English and one who is using an out-dated version of the Google translation engine, and a 3rd member inserting comments that have nothing to do with anything, especially not the previous sentence. Additionally, I was left with tray items in the main game, and some real oddities in the bonus game that left me shaking my head. Go ahead and buy it - it's plenty of fun - just be prepared to see a bevy of question marks in your thought bubble. Rated 3 out of 5 by timothya from Not Quite There I love this series - the player is a detective working for a Cardinal in maybe 17th century France? - but this one suffered from fragmented writing that looked as if it were put together from multiple authors with different ideas of where the story was supposed to go. Pros: Graphics were fine for me, although I hear some complaints from others. Nice atmosphere, familiar music and voice acting was at least adequate. I like puzzles and so these did not seem too frequent. HO scenes fine but the ones in storyboard form got a little tedious. Cons: Way too much exposition, both in text and especially in the all too frequent cut scenes that detracted from the game's pace. There was a nice little mystery here waiting to get out but the reveals were clumsy and obvious and worse, repetitive, and the characters never really appeared all that sympathetic. And, do we really need yet another world-threatening artifact whose principal use appears to be to save a failed relationship? Overall, a bit of a disappointment because of the unrealized potential. Fine as a practice game but not really up to the series's standard. Rated 3 out of 5 by ZekesPeach from Stop talking!!! Another game with more talk than action, more handholding than challenge, more back-and-forthing than progressing. Same old storyline where some evil thing or evil doer has cast a spell on someone or run off with them. There is an evil gadget, a floating wife, an injured husband, and loads of easy to find morphs and simple HOPs and puzzles with confusing or poorly written instructions. YAWN! I hope you really like talking if you buy this game, because there's lots of it, and it happens very slowly...you also can't do anything until you sit through it or keep trying to skip through it. Rated 3 out of 5 by syndney1099 from Not the best, not the worst. This review is based on the demo only. Please see other reviews for details of the game. There were parts of the game I liked. Even though the storyline is not the most original, there were elements that were different, such as the stone lions that I was curious about. The pace was generally good, bogged down a bit but picked up. You use items fairly quickly after you find them which keeps the pace going. You don't throw away your axe. LOL The graphics are okay although dark and the characters are a bit wooden. The HOP scenes were good, not too easy. Puzzles themselves were very easy. A lot of matching and putting puzzle pieces together which I don't find challenging at all. I am not good at morphing objects and as one reviewer noted they are easy to find if you remember to pay attention. A bit mechanically stiff. I had to click on them right as they morphed to get "credit". Music is a big part of a game for me and the music on this one was more annoying than dramatic. I too could not figure out the coins. I would wait for SE version of this one if you are a fan of the series. . Rated 3 out of 5 by sunnyglow from TIME IS OF THE ESSENCE IN THIS GAME OVERVIEW: Detective Antman! The Hourglass of Time has vanished! You are off to Tempoville, called out of retirement to handle this case by Count Von Mart, the current keeper of this artifact. Count Von Mart is a member of a secret order sworn to protect it from falling into the wrong hands. Whoever possesses the hourglass can drain energy out its victims, allowing the perpetrator to gain immortality. An unlikely source may be behind its theft and this culprit seems to have a diabolical scheme for its use along with two other artifacts. You must hurry! You have one night to stop this evildoer! OPINION: This game may appeal to those who like this series; however, I found it snail-paced and did not purchase it. The graphics are beautiful. This developer provides breathtaking scenes within their games. Nevertheless, gorgeous graphics do not create an enjoyable game. From the storyline to the activities, the game is a cookie cutter variation of the others in this series. The baying wolves and barking dogs return in this game and to me, are distracting. I like to play games with sound, but the animal noises were so irritating, I could not wait until the demo ended. MECHANICS: There are four (4) levels of play including a customized version. There are eighteen (18) achievements. Collect twenty-six (26) morphing objects (gargoyles) which allow you to receive items to add to a fort. I found the ones in the demo easy to locate. There are nine (9) wallpapers, seven (7) screensavers along with the usual concept art, music and video selections. You can replay ten (10) HOP scenes and twelve (12) puzzles. 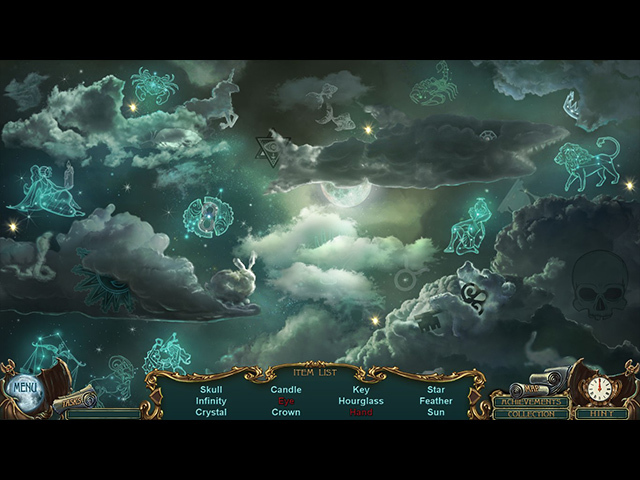 HOP SCENES: The demo contains storybook scenes, silhouette scenes, and lists of items. Some of the scenes are multiple-step with two different ways to locate items. There are two mini-HOP scenes in which the player searches for a small number of one item. My favorite scene is one in which the player searches for items based on their patterns. PUZZLES: The puzzles vary in style and difficulty. Most are easy, and a variation of ones seen in other games. I do not feel that any of them were innovative nor creatively designed. They are all standard fare. I have listed them below. SPOILERS: HERE ARE PUZZLES FROM THE DEMO: A. Sequence puzzle. Push tiles into the center of a door until all remain in the center. Pushing one affects the others B. Assembly puzzle. Choose a symbol from each of three different rings, which, when combined, create a given symbol. C. Rotating tiles puzzle. Rotate four (4) rings to restore an image. D. Map puzzle. Find your way through the streets of the town avoiding obstacles until you reach the exit. E. Match-3 puzzle. (Within the previous puzzle) Match up 3 or more barrels in any direction to remove them until none remain. D and E go together F. Matching puzzle. Match up symbols on a statue. G. Sequence puzzle. Press symbols on a door in proper sequence as per a given code. F & G go together. H. Rotating tiles puzzle. Click on tiles upon two plaques so they match two images on a sword. I. Assembly puzzle. Rotate parts of a key to match those on a keyhole. Click “Try” to test your results. J. Battle scene. Multiple step. (1) Matching. Match up images hidden under shields. (2) Jigsaw puzzle. Place pieces back into place to reassemble a shield. (3) Matching. Same as the first matching with the exception that the shields move clockwise after you match up two shields. K. Assembly puzzle. On a book case switch books on two shelves so that the symbols on the two books from the top and bottom shelves create the symbol in the center between the two books. L. Connection puzzle. Connect all dots on a grid without retracing steps. Rated 2 out of 5 by Magda640 from Boring. Boring. Did I say it was boring? Okay, I managed to last through thirteen minutes of the trial, but the Count was driving me crazy. His voice was monotonous and he had absolutely no sense of urgency. If my spouse were being attacked by magical ghosts that were sucking out the life force, I think I would be a teensy bit perturbed! I do own a number of the games in this series, but I'm giving up. Life is too short. I wish the devs would hire some real voice actors. Try it for yourself. I really don't recommend it.